Automotive is hot topic at MIPI DevCon 2016 - Touch Display Research, Inc. 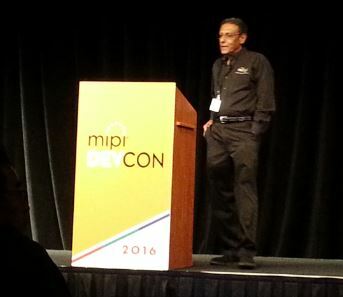 I just attended the MIPI DevCon 2016 conference, which was held by MIPI (Mobile Industry Processor Interface) organization in Mountain View, California this week. It’s a very good conference with 200+ attendees and 20+ exhibitors this year. MIPI (Mobile Industry Processor Interface) is a global, open membership organization that develops interface specifications for the mobile ecosystem. It was founded in 2003 by ARM, Intel, Nokia, Samsung, STMicroelectronics and Texas Instruments. Now, MIPI has over 250 member companies worldwide. 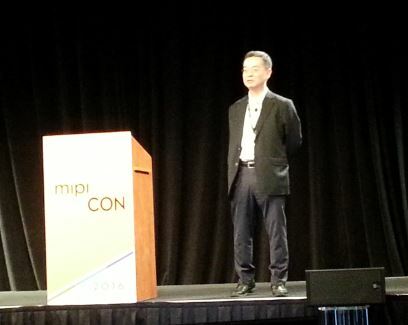 Several presentations discussed MIPI in automotive industry. For example, Toshiba’s general manager, Yoshimoto-san talked about their image recognition processor in automotive ADAS (advanced driver assistant system). Mixel’s CEO, Mr. Ashraf Takla discussed camera-based and radar-based automotive ADAS interface and their work with NXP. In the recently published “Automotive touch, display, ADAS and touchless HMI 2016 report,” Touch Display Research Inc., a market research and consulting firm, analyzes automotive touch screen, display, ADAS (Advanced Driver Assistant System), and touchless human-machine-interaction (HMI). More than 500 companies working on automotive technologies are profiled in the report, which includes over 100 automotive companies, over 200 touch screen companies, over 200 touchless human-machine-interaction (HMI) companies and about 30 display companies. The automotive industry’s adoption of new technologies has accelerated in the past couples of years. More and more touch screens and displays are integrated in the automobiles for better infotainment, intuitive control, and safety. ADAS (Advanced Driver Assistant Systems) and touchless human-machine-interaction have saved lives. We forecast that automotive touch, display, ADAS and touchless HMI market will have rapid growth in the next several years. The “Automotive touch, display, ADAS and touchless HMI 2016 Report” is available immediately and includes a PowerPoint file of over 380 pages and an Excel database. This entry was posted in automotive, Displays, sensor, Touch screens, touchless control and tagged ADAS, automotive, automotive market, MIPI, MIPI DevCon 2016, Mixel, Toshiba on September 14, 2016 by jennycolegrove.